The countdown clock is ticking: Tuesday will mark the launch of Axios Space, a new weekly newsletter covering the latest in the business, trends and science of space. Also, lots and lots of 🚀. Sign up here for the newsletter, written by the talented space reporter Miriam Kramer. Why it matters: The Great Barrier Reef is the word's largest coral reef ecosystem, spanning 1,400 miles from north to south off the eastern coast of Australia. The new results add to a series of grim findings about just how vulnerable this reef community, long viewed as too big to fail. The new findings also raise the provocative question of what healthy coral reefs will look like in the future, if they exist at all, as ocean waters continue to heat up from human-caused global warming. What they did: For the study, researchers at Australia's Center of Excellence for Coral Reef Studies examined coral reproduction, or spawning, rates from one year to the next, by combining years of in situ measurements out on the Great Barrier Reef. Researchers compared spawning behavior in years prior to the marine heat waves that struck two-thirds of the reef in 2016 and 2017 against what happened immediately following the heat waves. Such heat waves are also known as coral bleaching events for their tendency to turn corals a ghostly white as heat stress causes organisms to kick out symbiotic algae that lends corals their vibrant colors. The study found that such heat events compromise the reef's capacity to recover by causing a sharp plunge in reproduction rates. By killing adult corals, the heat waves slashed the rate of reproduction and skewed the balance between coral species. According to the study, the number of new corals settling on the Great Barrier Reef declined by 89% following the assault on adult corals in 2016 and 2017. What they're saying: The increased frequency of bleaching events means that more corals could perish before they can recover. 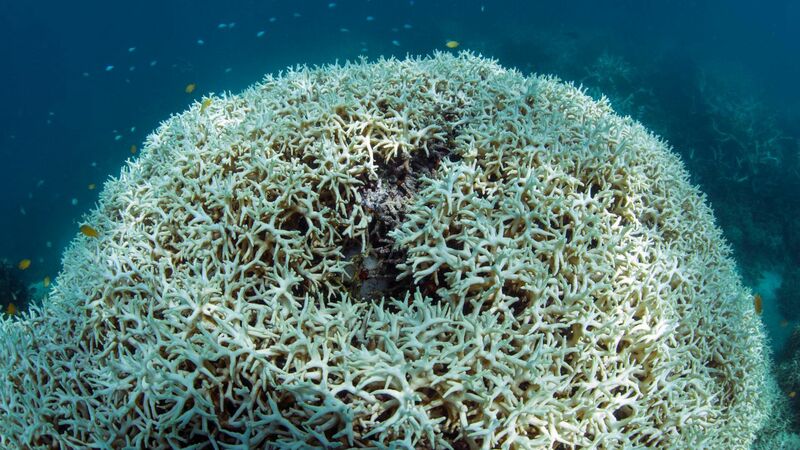 "One more large scale bleaching event in the next few years and it could be curtains" for many parts of the Great Barrier Reef, study co-author Andrew Baird, of James Cook University in Australia, tells Axios via email. But the new study is just one snapshot of the reef's damage right after a massive shock. But, but, but: Severe coral bleaching events mean that the surviving corals may be more heat-tolerant and could survive future events, if they're allowed to mature first. Madhavi Colton, program director with the nonprofit Coral Reef Alliance, says she's eager to see what happens with coral recruitment (the process by which coral larvae attach themselves to existing coral) beyond just a single year after the bleaching events. The bottom line: According to Kim Cobb, a climate scientist and coral expert at Georgia Tech, the future of the world's reef ecosystems will look nothing like what we've known. “Will they ever get back to where they were before these events happened? Probably not," she says. "Will they look very, very different? Will there just be a different kind of reef there, will they have a different functionality? Maybe yes.” She added, though, that the outlook for the world's reefs is "pretty bleak." A fragment of a planet orbiting a white dwarf star 400 light-years away gives scientists a rare glimpse into the death of a solar system, according to a new study published in the journal Science Thursday, Axios' Miriam Kramer writes. The big picture: The planetary fragment, known as a planetesimal, orbits within a disc of gas and dust — the remnants of other, destroyed planets — surrounding the white dwarf. According to some stellar forensics, the world is thought to represent the remains of a once larger planet that was battered by the death of its star. Why it matters: One day, billions of years from now, our sun will run out of fuel, first becoming a red giant and then collapsing into a white dwarf itself. Learning more about other solar systems like ours can help scientists, in turn, figure out what our cosmic neighborhood might look like in the distant future. What they did: The team of researchers behind this study found the planetesimal, which is thought to be about the size of the largest asteroids in our solar system, by observing the disc of debris around the star. They used a telescope to detect the variations in light caused by a stream of gas emitted by the planetary fragment, marking the first time this method — known as spectroscopy — has been used in this way, study lead author Christopher Manser of the University of Warwick tells Axios. What they found: By observing the white dwarf, which is a tiny, dense remnant of the core of a star, as well as the planetesimal, scientists were able to watch the planetary material "pollute" the atmosphere of the white dwarf. This occurred as the dense star stripped away the outer layers of the world. Manser found that the material falling into the white dwarf's atmosphere is similar in composition to a rocky crust or mantle like our Earth, and this insight allowed him and his collaborators to work backwards to try to understand what the planetesimal once was. What they're saying: White dwarf researcher Andrew Vanderburg, of UT Austin who wasn't involved in the study, tells Axios that "polluted white dwarf systems are important because they are the only way we have to learn what minerals and elements rocky planets in other systems are made of." Scientists are seeking early diagnostics for Alzheimer's that could predict who is likely to develop the disease before noticeable symptoms materialize, Axios' Eileen Drage O'Reilly writes. In recent months, a large study was published showing that certain PET scans can lead to more accurate diagnoses, while other researchers are looking for disease biomarkers that may be evident in the eye, spinal fluid or the blood. Other exciting developments in the works, Fillit says, are tests of early diagnostics in the eyes, blood and spinal fluid that look for amyloids and tau, plus inflammatory and neurodegeneration markers. He expects there will be a blood test in a couple of years and says "this is a really exciting time for biomarkers in this space." Biomarkers are something — such as amyloids — that can be measured and indicate the possible presence of a disease. On Friday, the New Yorker published a wild tale about a bombshell claim: A paleontologist working at a dig site in North Dakota has found fossil evidence that shows the most detailed picture yet of the devastation wrought just minutes after a massive asteroid slammed into what is now the Yucatán peninsula about 66 million years ago. Geologists widely believe that the impact, near the Mexican town of Chicxulub, set in motion a series of cataclysmic events that led to the extinction of the dinosaurs, and much other life on Earth. The story, not surprisingly, went viral. The New Yorker piece also quickly caused a controversy in the paleontology community. Many scientists dissected the story and the evidence in lengthy Twitter threads that are worth reading. The story centers around a fossil hunter named Robert DePalma, currently a graduate student in paleontology at the University of Kansas in Lawrence. If this is true, it's HUGE news. We may now know exactly what happened on the very day, or close to the day, the dinosaurs died. That's incredible, mind-boggling even. However, to quote the late Carl Sagan, "Extraordinary claims require extraordinary evidence." And given how science works slowly but deliberately to replicate results, it's too soon to know whether DePalma's claims will hold up. Another is the portrayal of DePalma, a virtual unknown in the field. He is depicted as a caricature of a paleontologist, pulling up to the reporter in an SUV while blaring an Indiana Jones movie soundtrack. DePalma mentions being "98% convinced" of his bold hypothesis after finding a freshwater fish and a marine reptile in the same location, which made it seem like his mind was made up going into the dig. "I hope this is all legit—I’m just not 100% convinced yet,” Thomas Tobin, a geologist at the University of Alabama in Tuscaloosa, told Science. But, but, but: Other researchers unaffiliated with the work expressed amazement and great interest in DePalma's findings, and they did not indicate the claims are too good to be true. Why you'll hear more about this: The first paper is just the beginning of a scholarly debate about the North Dakota site that will continue to play out in the coming months and possibly even years. Israeli lunar lander Beresheet is now orbiting the moon: The crowdfunded lunar lander is nearing its target. Boeing delays first uncrewed launch of Starliner to Space Station: The new date is just the latest in a series of missed deadlines. Mysterious polio-like illness could be from "hit and run" virus: Researchers are still puzzled over an illness that is affecting mainly children. India's anti-satellite test put the Space Station at risk, NASA says: The NASA leader sent an angry letter to his Indian counterpart. Scientists recently discovered a field of hydrothermal vents about 6,500 feet underneath the Gulf of California, where they observed tall mineral structures that host a diverse array of marine life. Why it matters: The purpose of the expedition, which was partly carried out using the remotely operated vehicle known as SuBastian (the platforms are named after characters from the 1984 sci-fi film, "The NeverEnding Story"), was aimed at examining hydrothermal and gas plumes where scientists think ancient life forms developed, and where undiscovered species lurk today. Details: These towers reached up to 75 feet tall, according to the Schmidt Ocean Institute, whose research vessel, Falkor, was used for the expedition. Mandy Joye of the University of Georgia and her team of researchers also found structures that look like mirrors given the extremely hot fluids that lie underneath them. The minerals in this location contained metals, and the fluid had high amounts of sulfide, yet the area was teeming with life. “We discovered remarkable towers where every surface was occupied by some type of life. The vibrant colors found on the ‘living rocks’ was striking, and reflects a diversity in biological composition as well as mineral distributions,” Joye said in a press release. Thanks so much for reading, and see you back here next Thursday!